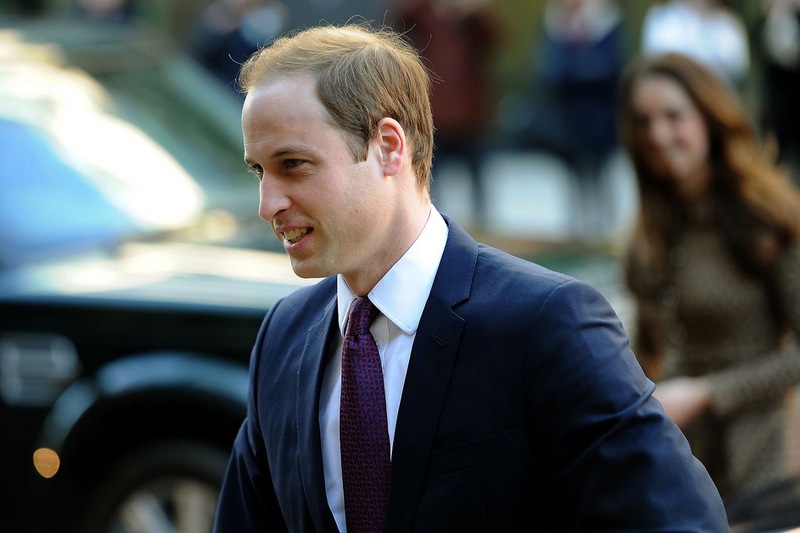 It was a cold and early start for the Duke and Duchess of Cambridge in London's King Cross this morning, where they visited the head office and projects of Only Connect. A significant media presence awaited William and Kate's arrival (forty five photographers in fact), however, royal photographer Mark Stewart noted members of the public did not turn out for this morning's appearance. 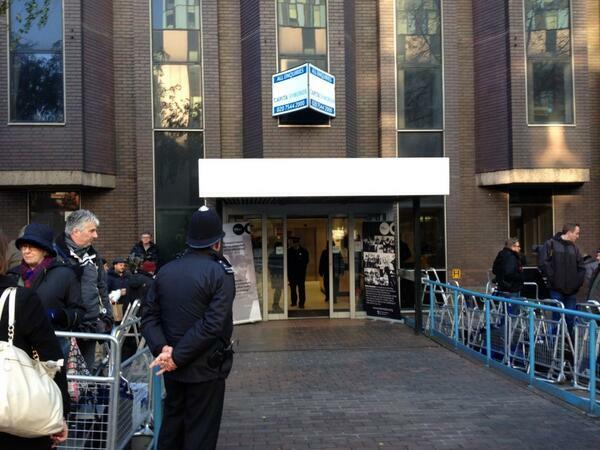 The Mirror's Victoria Murphy shared a photo from outside the charity. The couple exchanged smiles as they walked in the office where they were greeted by representatives from the charity. Only Connect is a crime prevention charity and a positive community, supporting prisoners, ex-offenders and young people at risk of offending in London. It delivers a range of programmes in prisons, schools, JobCentre Plus, Youth Offending Teams, and the community across London, reaching 10,000 young people annually and hundreds of adult offenders. The organisation's projects have been shown to reduce re-offending by half, and a 75% improvement in pro-social attitudes among students whom the work reaches. The purpose of today's engagement was for the Cambridges to see first hand how Only Connect supports ex-offenders and young people and to learn about how they are working with charities in this field. It was an interesting choice for William and Kate; it is important to see them supporting a diverse range of organisations and raising awareness in different fields. Crime statistics continue to be deeply concerning and Only Connect strives to help offenders find their place in society and those at risk of offending, ensuring crimes are prevented. Their Royal Highnesses visited two further complimentary projects based at the head office premises. Bounce Back began as a small painting and decorating company in 2010. Since then it has expanded to become a charity and social enterprise, working with several prisons, as well as London probation, to offer training, work experience and employment to offenders at the end of their sentences. 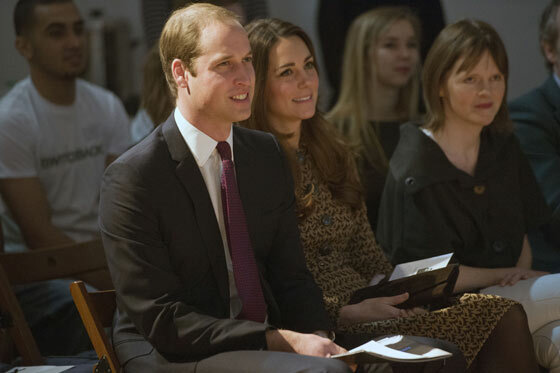 William and Kate also visited the projects of Handmade Alliance - a social alliance which trains prisoners to produce high quality hand-finished textile products for British designers. 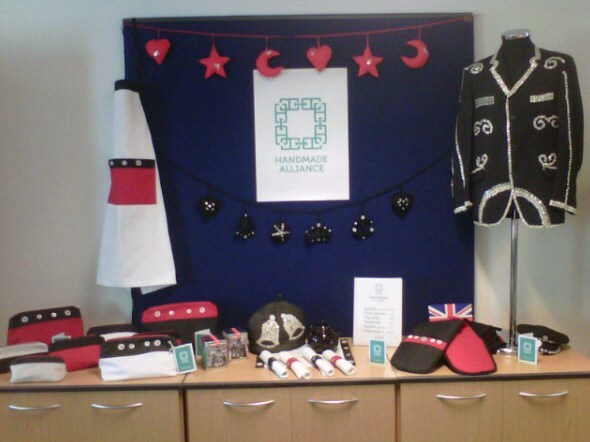 The talented team created a workshop display for the royal couple to view. Kate watched volunteers making bunting and said to them "Are you guys sewing on buttons? It looks very fiddly work. It's quite therapeutic, isn't it?". Kate also revealed she wasn't so good at poetry but her photography is her passion, if she's going to do anything artistic, it's that. I was lucky enough to have the opportunity to chat with Sarah Baulch (the blonde lady pictured above) who kindly shared her thoughts on meeting the Duchess. She was particularly impressed by her interest in the organisation. 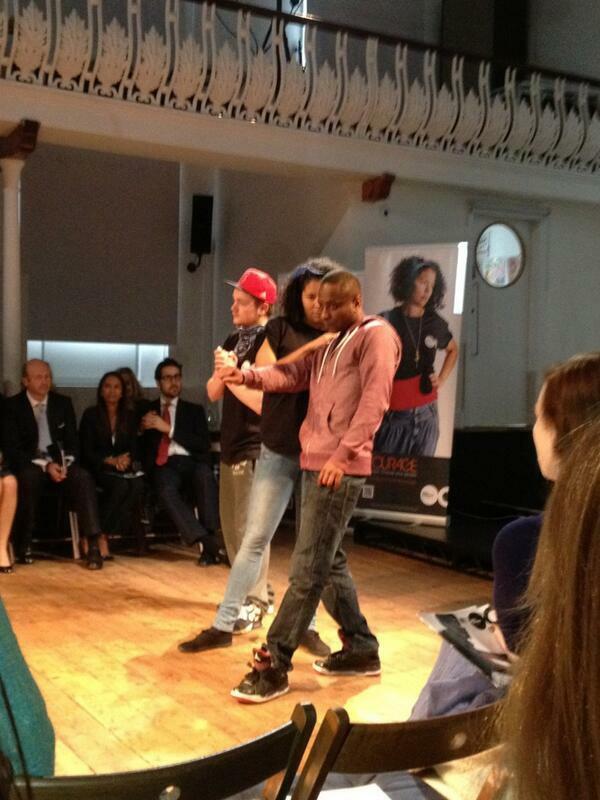 The Duke and Duchess enjoyed a dance performance at a nearby venue. The dancers put on a very entertaining show. Kate chatted with the dancers after the performance. 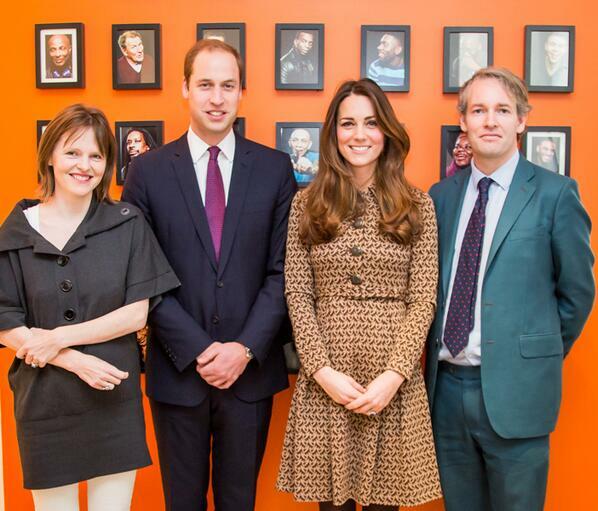 Only Connects co-founders Danny and Emma Kruger with William and Kate. The Duke and Duchess were given a personalised babygro for their son before leaving. More from William and Kate's official website. 'Asked what the Duchess thought of white babygro, which featured the Only Connect logo and the words Prince George underneath, Mr Russell-Andrews said: "She was very pleased about it. She said it's a very good fit because he's growing very fast, and that he'll like it". Mr Russell-Andrews' young daughter Teegan tried to take it back, the Duchess said "They're very demanding at this age". A crying Teegan was soon placated with cake , The Duchess tried to pieces of cake herself, one an iced ginger sponge and the other a chocolate cake'. Kate looked delighted with the gift. The Duchess brought back her Birdie Wool Jacquard Shirt Dress by Irish designer Orla Kiely. 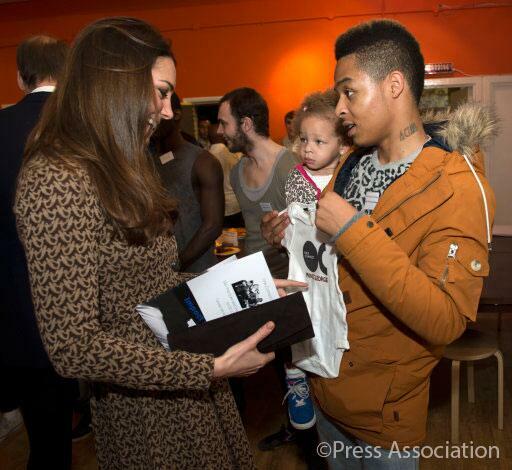 Many readers will recall Kate first wore the dress during a visit to her patronage The Art Room in 2012. The dove print dress is from the designers Autumn/Winter 2011 Collection and it originally retailed for £325. It is described as "Wool long sleeve dress in Birdie jacquard fabric, deep pleats in skirts and pockets in seams, Button fastening cuff". It is a lovely dress and very appropriate for the current season. All thee Middleton women are fans of the Queen of Prints, Orla Kiely. I do hope we see Kate in more of her designs. Kate teamed the dress with her brown suede Aquatalia 'Royal' Booties. The stylish boots are described this way. 'Silvertone hardware details the side of a weatherproof suede bootie fashioned with an elastic inset at the side for an easier fit. The slip resistant rubber sole offers excellent wet weather traction while the soft microfiber lining keeps feet dry. Approx heel height 3 and a half '. The 'Royal' booties are exclusively sold at Nordstrom and appear to be sold out at the moment. The brands 'Roma' Bootie appears to be a new take on the popular ankle boots encompassing the same style. It is currently available black suede, chocolate suede and wine suede for €353. The updated version of the 'Royal', the 'Royalty' is available on the Aquatalia website. 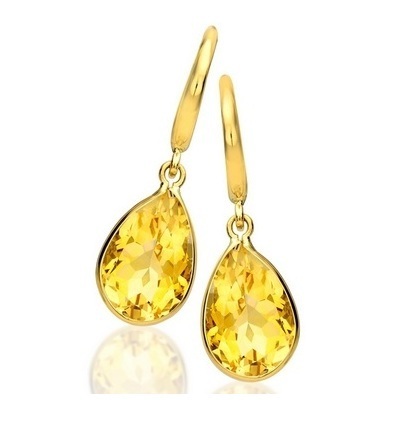 Kate accessorised with her £495 Citrine Drops by Kiki McDonough. And Kate carried her brown suede clutch and wore a watch, quite possibly her Gucci piece. What did you think of Kate's look today? I liked it very much the first time she wore and I think it worked again today. Reporters at the event mentioned how well Kate's hair looked and noted she had highlights recently. Both William and Kate looked very tired, no doubt it may have been a late night with little George. You can watch a video from the event at ITN Source. Gosh--you're quick Charlotte---many thanks. Loved this dress/coat the first time round and I think it looks even better this time. Only one problem with suede boots or shoes--as soon as you put your foot down they get covered in dust. Usually I am not keen on those sort of bootees, but Catherine manages them so well---matching them to thick tights and ensuring they are not baggy round the top. I'm so happy to see her hair looking so much better today! Do you think she got a cut? I still wish she'd get a dye job done but in general she looks significantly better than last time. Much more rested. Duchess is back to her normal - beautiful hair and not so tired looking. Whew! I was a little worried for her. Glad she's back. Poor dear Kate seems extremly tired. In the DM photos she looks as she just stopped crying. I don't know Charlotte, how you could select photo's for this post, but here she looks fine. Let's hope prince George will soon sleep better. Many thanks, Charlotte, for this incredibly quick post.... amazing! 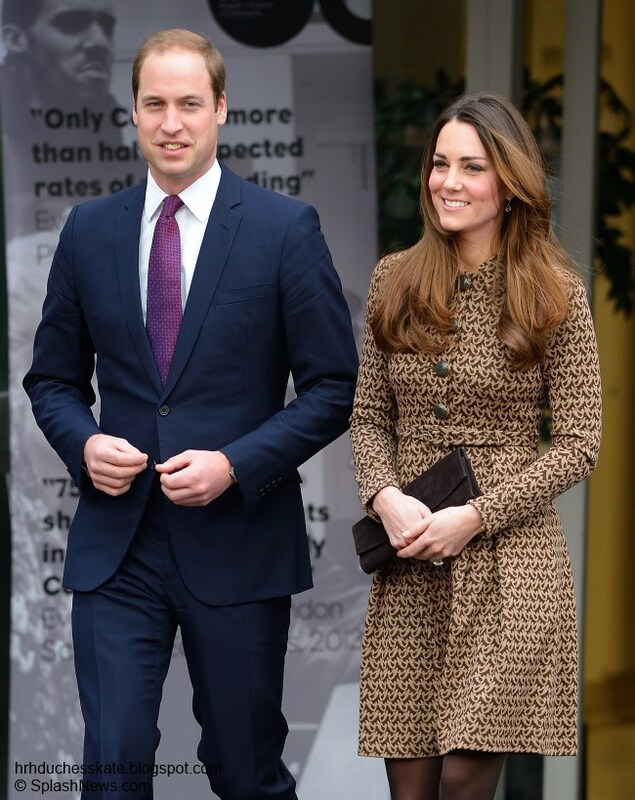 I love this coatdress, I think she should wear more Orla Kiely, she has wonderful youthful designs. She still looks very tired in certain photos. I wish she would do something about her hair, it is still so out of "order". Anyway it was good to see her again out and about. Thanks for the post! Great post Ms. Charlotte- Kate loved beautiful as always today. Loved the way William had his arm around his beautiful wife today. And that look of love between them just melts my heart. Ya both looked tired but what do people expect, they have a new born at home. And I bet George like's to keep his mommy & daddy awake at night. But that is what come's with being new parents. Love the fact that she recycled again. And for the pepole who got on her for her "grey" hair, there was none today. Ya maybe she should have woren it up but she did not so that is no big deal. Once she got in doors the hair was fine. To be personally honest I really don't care how she wears her hair. That is her business not mine. She is beautiful no matter what she wears or does with her hair. I was never a great fan of this dress... (the pattern is ageing and too 70's...), but I think Kate looked good today, as usual. It is fantastic that she and William haved decided to support and draw attention to such a cause. Hugs! See you all tomorrow! I think this is one of her worst dresses! It looks like upholstery fabric. I am "she needs a pop of color" fan club.. Too much brown for a dark headed beauty. I think she looks wonderful! Much more like her old self--though still tired, little George must be a handful! I love her makeup as well, the brown shadow is so much softer and more flattering than the black she tends to favor. I have a 5 months son...my eyes are exactly like hers!! Catherine looks great and its a good cause. Fast as always Charlotte :) I love the dress, the colour is very warm. I am very fond of these kind of shoes, I own about three pairs of this kind! Her hair looks better than at Remembrance Sunday and the poppy engagement, but I do have to say there is rather much going on if you see what I mean. Her natural colour at the roots, dark brown, and now the highlights. A bit too much if you ask me (just my opinion), but her curls are beautiful here. I thought she looked like her old-self too, except for really tired, which actually makes me kind of happy because of wee George. I love the shape of this coat dress. She looks great but her hair is still driving me crazy. It looked great when it was curled on remembrance day, then you could not notice that her hair is lighter at the bottom. Her hair looks so much better when it is a dark chocolate, her hair must naturally get lighter in the summer. I really hope she will dye it when she is done breastfeeding. She still looks amazing. What a handsome young couple! I like to see the two of them together. Courage Wills and Kate! Little George will sleep his whole nights soon. Lovely post Charlotte! Thank you so much! She looks great again! But I'm not sure-since the birth of little George she/her face looks different...or maybe that's just her tiredness. She looks older, more mature. Anonymous I've been saying that as well that she looks different. I just couldn't figure out why but Vittoria I think you're correct she does look older. Not in a bad way just that her face has changed since having a baby. I might add that she's also not quite as thin as she was the first time she wore the dress. Her face is fuller. Yes, I've noticed her face has changed quite a bit. Don't judge me, please, but to me it's like she's lost her "magic". Kate is wearing less make-up; it seems as if she did not line the lower lid (see Daily Mail photos) I met a Miss America, and she had make-up on in gobs. It must have something to do with how you look in photographs. I admit, I like the gobs, because she is prettier. Looking "more like herself" could be a change, It seems like she doesn't feel like same need to prove herself, now she has borne an heir. I hope not! @Serendipity- How did Catherine's face change? Do you think she had something done to it??? The only thing I think is that now she is not pregnant, her face is not as full. But it is the only thing I see different. How about you? Seeing the picture of her hair with the same dress last year, I prefer her older hair style. It looks nice now, just not quite as good. The dress is very good look. Thank you all so much for commenting. 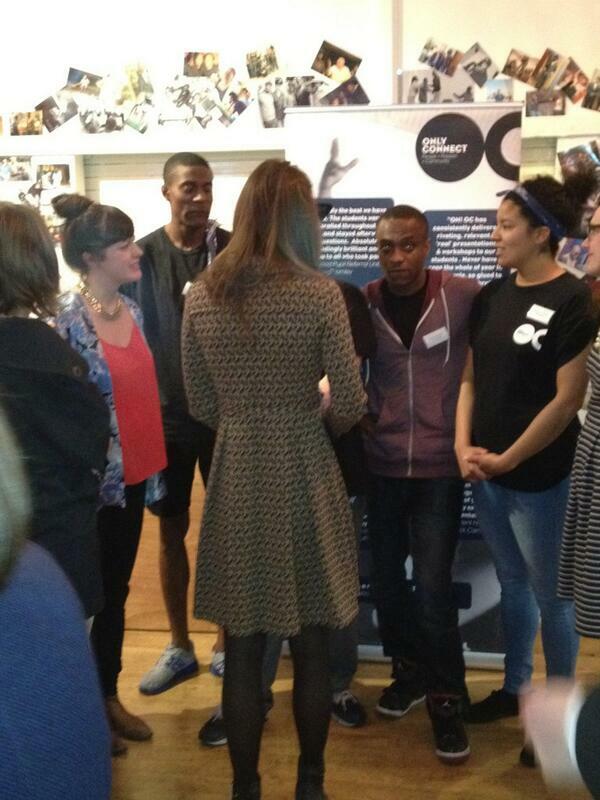 It was lovely to see William and Kate out and about on a joint engagement and supporting ex-offenders charities. I was speaking with a member of one of the organisations who mentioned how difficult awareness is and a royal visit will make such a difference. I believe I read that the Middletons have been invited to Sandringham for Christmas, for at least part of the holiday. I lust after those boots, wish those were in my budget. Liked her entire ensemble today. I agree that the fabric design could look a bit 70's granny but feel the cut saves it. The Duchess looks very well. Funny, I remember the 70s, but I thought the dove dress looked like a child's design rather than a granny's. It seemed appropriate and fun for the occasion. The Duchess looks nice in brown. Thank you Charlotte for this beautiful fast post with perfect little tidbits of the conversation they had with the members and staff during their visit. Interesting insight in the charity's work. I think their visit will indeed make a difference, :-) hopefully. I think the Duchess looked gorgeous today, especially in the picture above the one with the coat in which she is holding the red flowers and the box you can see how beautiful she is. Very charming. That photo is from when she wore the dress the first time. Hi, Amy! I've read that same comment and wondered what had happened! She needs to get some house help or assistance. Or get more if she already has someone - Kate looks exhausted! There's nothing wrong with getting help if you can afford it and if your job is to be out in public, photographed. Hihi :-) Just looking at the pictures again and wondering if William has put on some weight since he stopped RAF? Hehe I thought so too! And in one picture you totally see the simalarity to his father, not sure if that`s a good thing. Really what Catherine wore is immaterial----the important thing is they visited a charity of which I had heard little before, but the fact that loads of photographers turned up, puts it in the spotlight. Jean, I think you're right. She should be more than the sum of her clothing and jewellery. I mean, William wears the same suit with a different shirt and tie at every engagement (OK, maybe he's got more than one suit but they're all blue!). I'm really disappointed with this look it is so dull and drab. For a royal duchess to turn up in such scruffy looking boots is a no no - suede should be banished for public engagements and Kate should invest in a good suede brush for her boots - these look terrible and in fact they look like an old pair she has had stuck on to some platform soles by her cobbler! I do not like the dress either too short - she needs to dress more classy we don't want a Primark Princess as my (male) friend keeps saying. I agree with other posters that Kate needs to wear some colour - eg red is so good on Kate. At least her hair looked much better this week. Thank you Charlotte, for including so much good information about the charities in your posts. I find learning about what exactly they do is most interesting and gives me an appreciation of the work the royal family does in supporting and raising awareness for these organizations. 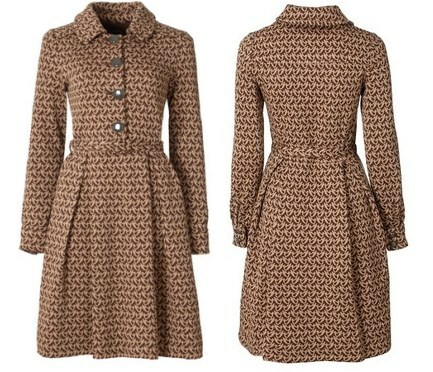 I like the Orla Kiely coat dress. I guess it's really a matter of opinion, because like Eve from Germany, I too remember a similar kind of dress from the 70s, but unlike Eve, I wore it as a young college student and liked it, not thinking it was reserved for grannies! (BTW Eve, I agree with you on most things except this one point!) The duke and duchess both looked attractive but as nearly everyone agrees, tired. Thanks for the post. I wasn't even aware Kate had an engagement today. Definitely glad to see this. Kate looked a lot better than she has in the past couple engagements. I don't love the dress but I don't hate it either. It's kinda here nor there. The hair is looking better but my what a major difference from the last time she wore the dress. She looked happy albeit tired little George must be keeping them awake at night. Overall I give this look a major improvement. Kate looks lovely I like this dress and love her hair. I think it is sick that reporters are going on today again about her grey hair because she still hasn't coloured it. I am glad she is telling them a big clear message '' I don't care what you think, my baby is my priority''. Thanks again Charlotte beautiful pics and post as usual. Love those booties! What a cute style, even if they don't look brand new. But the dress - eh, not so much. The style is so very dated - my grandmother wore a dress like that back in late 70's. I like that Kate dresses conservatively, but she could still be modern. I can't imagine there would be much "Kate effect" from this dress. Otherwise, she looks lovely as usual. She must have terrific stamina to pack all those visits into one day and still be smiling and engaged at each one. Only Connect sounds like an unusual choice of charity for royals - I'm glad they're doing it. It is nice seeing her look more like herself, which is, I am sure, how SHE wants to look. Kate looks back to almost her old self. I always thought this dress was cute. As for the booties looking a little worn -- I have the same pair and they can get that way, but if you use a suede brush and brush them, they will look as good as new. It's amazing at what a suede brush can do -- they look scuffed before and then brand new after. At least for me. It does appear that she had some layers cut into the front of her hair to avoid the weighed down look and to create volume at the top, which good. Although it doesn't look as perfect as it used to, she could be trying to do it herself, so props to her. Either way, a definite improvement over the style she had with the middle-part and ringlets routine! I think Kate does a good job in dressing appropriately for the occasion. This happens to be a very informal, relaxed event. She's not trying to be glam or "knock your socks off." It makes me laugh when the media goes bonkers because she "recycles." She's just doing what the rest of us already do... wear our clothes more than one time! I love the fact that she could use a new pair of boots. Obviously clothes shopping is low on her "to do" list. Her hair looked lovely today. A very interesting post. Lovely to see the Cambridges out as usual =) Even though some say Kate looked tired - I think she looked more fresh-faced than before. I suppose George is probably sleeping more? Even though it's recycled - I love the Orla Kiely outfit right down to the boots - She always makes anything old or new look good! I loved her hair - it looked like it was styled differently than previous occasions. Most of all I was so touched by the interest she took in meeting and talking with the different people at the event. I'm sure they will remember this visit for years to come. What a precious day for this charity. A simple visit sparkled a very much needed interest in their fabulous job. These people are really changing the world, in my point of view. Working with ex-offenders is a real challenge and I feel good about admiring people who support such an important cause and I honestly hope one of them, or maybe both, decide to be a patron of Only Connect. If they made a difference today, one can only imagine what can be done in years to come. I see she's cut a few inches of her hair... I like it! The bounce and volume are back... And I love it when she wears her hair in a darker shade, her natural shade is so pretty! Prince George must be a very difficult baby! The Duke and the Duchess looked very tired today! I'm sure they'll laugh about it in the future, though! Let's hope that Prince George gets a bit calmer and let his parents sleep a little bit more! Sleep deprivation is terrible! Thank you for taking the time to write an amazing post, Charlotte! She makes people feel at ease by looking approachable-- this is her great talent. Thanks for the new post. She did look a little tired in some of the pictures, but that is perfectly understandable. Obviously, she is devoting most of her time and attention to taking care of George and for that she deserves kudos rather than criticism for the inevitable results. Kate looked pretty and I have always been a fan of Orla Kiely. Her smile is so bright and beautiful! She looked more rested, so hopefully little George is giving his mommy and daddy a break at night. :) If and when there is a baby brother or sister, maybe they will be a bit easier than George. He seems like quite the rascal! Charlotte, thanks for the great post and especially giving all the info on Only Connect. It helps to know more about the charities William and Kate are supporting. Again it was WONDERFUL and refreshing seeing them together today! Hello everyone! I love her look today, very elegant and calm. Exactly what is needed for such occasion. Chocolate brown suits her very well. I just love this look on her- she looks so well in brown. However, I do think that her hair is more flattering when it's a bit shorter like in the photo from 2012. She is so slim and I think that the longer hair is a bit too much, especially since she has such beautiful thick hair! Love this ensemble from top to toe. It's entirely appropriate for this engagement. I don't understand the logic of people who insist Kate should be wearing couture costing thousands of pounds when so many people in the UK - and around the world - are struggling. I've always liked this dress, the only issue I have with it is it seems VERY high-waisted on Kate, almost an empire waist, but on the model or mannequin, the waist hits at the normal waistline. I love that she wears boots that are clearly comfortable and have a bit of wear about them. She looked better today than she has in weeks.